– gifts in the form of money for Mufti Abdullah and Appa Sara and the staff. – The balance for the Orphanages running expenses. 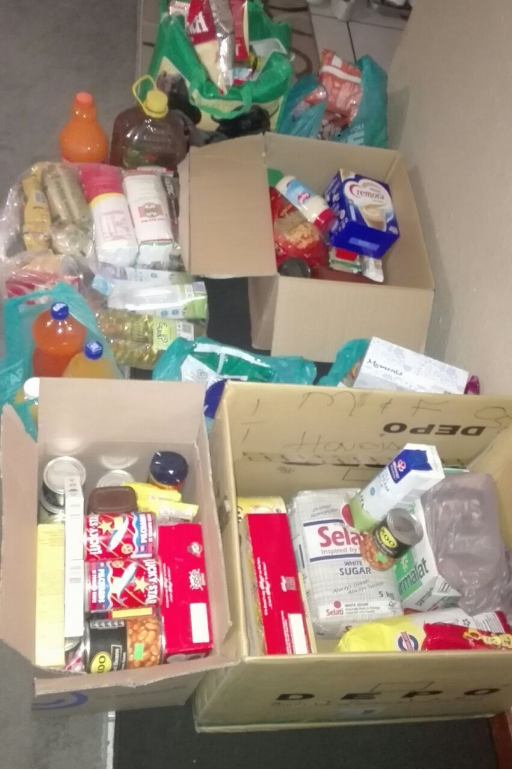 – Several items were donated too which were handed over. – Gift bags containing goodies for the children were made from sponsors. Children, families and some of the community members arrived at the Orphanage at around 11h20. We were greeted with warm smiles and open arms by the children who sang nazms for us in gratitude for the visit and gifts. We make shukr to Allah for granting us the ability to assist the Orphanage. These are small efforts that we make purely for the pleasure of Allah and we hope that we can continue this throughout the year Insha’Allah. Jazak’allah to the students, individuals, families and community members who assisted and contributed towards this initiative. May Allah accept and reward you abundantly for your efforts. Alhamdulillah with help of Allah SWT, the community was able to band together and provide much needed aid and assistance to the worker whose home burnt down on tennis road. We make shukr to Allah SWT for having provided us the ability to be able to provide for others in need from his boundless ni’mah and barakah and more importantly, we make shukr for whatever we have been provided on a daily basis. Jazak’Allah to everyone who assisted in the contributions (cash and kind) and special thanks to Moulana Farouk for driving this initiative. Muslims should not be judged based on propaganda but rather through interaction and understanding of who we are. The letter of gratitude from the worker as well as images can be seen in the link below. When small efforts come from many people simultaneously, the result has a large impact. A community united is a community strengthened!